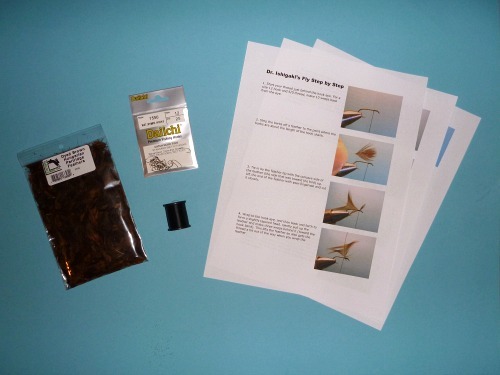 The "One Fly" Tying Kit™ - Ishigaki includes a package of 25 Daiichi hooks, the materials required to tie 25 Ishigaki flies, and step-by-step instructions with photos of each step. It is a great way for a beginner or experienced fly tier to try out a new pattern without having to buy a whole rooster saddle. For that matter, even a quarter saddle will tie hundreds of kebari. If you just want to tie a few of the flies to see if you like the pattern, the "One Fly" Tying Kit™ Ishigaki is not a bad way to go. When Dr. Ishigaki gave his tying demostrations in the Catskills in 2009 and in San Francisco in 2010, he used rooster hackle to tie the flies. My first version of this kit used Whiting genetic rooster saddle hackle, but when it became fashionable to use saddle hackle as hair extensions my supplier stopped carrying the Whiting hackle. I then switched to brown Woolly Bugger saddle hackle, which is actually probably closer to what Dr. Ishigaki used in his demonstrations, but the hackle barbs were really too long for the hook. I then used a brown India Hen Cape, until my supplier stopped carrying it. I switched to natural India Hen Back, but they started getting darker and darker, until the last batch I bought were more black than brown. I have finally settled on brown dyed partridge feathers, which are the right color and make excellent soft hackle flies. Tying the fly as a soft hackle produces a fly that probably works better in most of the waters we fish here, which are often not the swift flowing, high gradient streams Dr. Ishigaki fishes in Japan. The Ishigaki is a model in simplicity, consisting of only a hook, a hackle feather, and the thread necessary to tie the feather onto the hook and wrap a body. It is a good first pattern to learn on, and could potentially be the only pattern you need to tie. After all, it is the only pattern that Dr. Ishigaki ties, and he knows more about tenkara than any of us do. The step-by-step instructions are pretty much the same as shown on my Ishigaki Kebari page, but most people probably don't have their vise set up in front of the computer screen. Note: The US Postal service does not allow head cement to be sent though the mail, so I cannot include it in the kit. Out of stock. I am getting out of the One Fly Kit business. 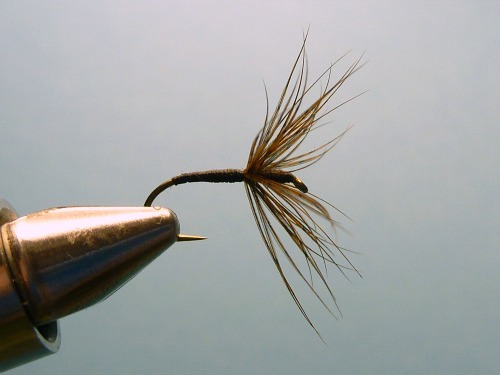 The Ishigaki fly is easy to tie even without a kit, though, and other than the brown dyed partridge for the soft hackle version, the materials are readily available. Step-by-step instructions are here. The "One Fly Tying Kit™ - Ishigaki is a kit that allows you to tie a soft hackle variation of the fly that Dr. Ishigaki has used for the last ten years. This is not Dr. Ishigaki's kit, nor is it a kit that he put together or endorsed in any way. Dr. Ishigaki freely shared the recipe and tying instructions for this fly when he gave his presentations in the Catskills in 2009 and in San Francisco in 2010.